You may have to reserve a time to see Delicate Arch, but is such a system really the best way to rescue Arches from adventure-killing congestion? (Chris Detrick | The Salt Lake Tribune) Visitors take pictures and hike around Delicate Arch in Arches National Park on Saturday, March 5, 2016. You may not need a reservation to tour Arches National Park — yet — but visitors should resign themselves to advance planning if they want to experience the southern Utah park’s sandstone wonders without being stuck in their cars. With its final decision a few months a way, the National Park Service has proposed a timed-entry reservation system to address the ever-increasing traffic snarls that are forcing visitors to wait in long lines at the park’s south entry on U.S. Highway 191 and “orbit” parking areas at choice destinations while waiting for spaces to open. Critics counter that a reservation requirement could knock down visitation by as much as 37 percent on peak days, taking a big bite out of the area’s tourism economy. Moab businessman Michael Liss is threatening to take the federal government to court, arguing a park reservation system could discourage international visitation. He and others, including Utah Gov. Gary Herbert, say there are better options, perhaps paving new entry roads and providing shuttles, although everyone agrees crowding needs to be addressed — and soon. The goal of reservations is to spread visitation out over the course of the day and the week, not to reduce overall numbers or turn away people, according to Arches Superintendent Kate Cannon. She urges guests to visit early in the morning or later in the day to beat both the heat and the crowds this summer. 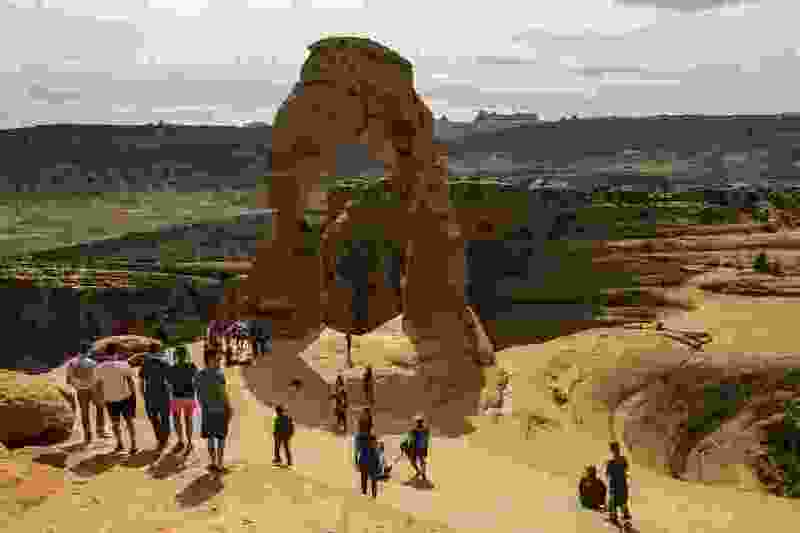 As has been seen at Utah’s other parks, Arches’ visitation has skyrocketed in recent years and now tops 1.6 million annually. The park has one road, funneling most visitors to three major attractions: Devils Garden, Windows and iconic Delicate Arch. A reservation is already required for the Fiery Furnace, which features a hike though a maze of sandstone fins. Liss contends congestion is built into the park’s design. The best solution, he argues in a recent Salt Lake Tribune op-ed, would be to redesign Arches to spread people out into less-visited features in the 76,000-acre park and provide transit. Through the years, the park has examined various ways to manage congestion and has concluded that reservations would be the best solution — despite misgivings from business and political leaders. The park service released a draft environmental assessment last year and fielded 400 public comments. A final assessment is expected this fall. Dropped from consideration were a shuttle system — similar to the one used in Zion National Park — and opening new access roads into the park from the west and the north, but Herbert would like these ideas to get another look. 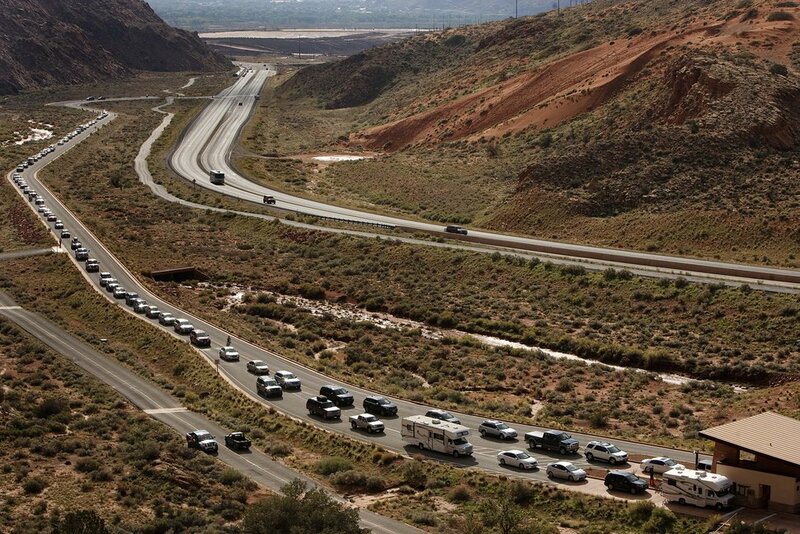 (Leah Hogsten | The Salt Lake Tribune) In this 2013 photo, visitors line up to get into Arches National Park. The park’s preferred solution would limit the number of entering vehicles to 2,006 between 7 a.m. and 6 p.m. each day during the busy March-through-October season. These visitors would buy their park passes to enter at a particular time and could stay as long as they liked. Off-season guests or those arriving before or after these times would not need reservations. Pros • Reservations would spread visitation evenly across the day and week. They also would remove the anxiety visitors face when they drive to a popular spot not knowing if they would be able to park. Cons • This plan would make it hard to spontaneously visit Arches. It could shut out some international visitors who usually come in July and August. To mitigate that concern, the park would set aside some daily passes. A vast parking lot would be cleared near the south entrance, where visitors would leave their cars. Buses then would ferry them to key attractions and the visitor center. The Zion system, initiated 20 years ago, is now integrated with transit through nearby Springdale and is mandatory for those entering Zion Canyon for much of the year. Pros • It would reduce the volume of cars on park roads and in parking lots, improving the safety and visitor experience. Cons • The high cost of added infrastructure and maintenance could be prohibitive. Long rides and crowded trails connected to shuttle stops could result as well. More than twice as many people visit Zion than Arches, nearly all heading up a narrow canyon on a seven-mile road. In contrast, the Arches road from the park entrance to Devils Garden stretches 18 miles, with paved spurs to Windows and Delicate Arch. While the Zion shuttle has been heralded as a success, it has come at a serious cost, in the form of crowded trails that Cannon would not like to see replicated at Arches. Existing unpaved Grand County roads could be upgraded, providing additional park access from the west at Willow Springs and from the north through Salt Valley. Pros • These roads would provide additional ties from Arches to U.S. Highway 191 and offer an alternate route to bustling Moab from the north. The roads also would distribute visitation around the park and into less-busy places like Klondike Bluffs and Herdina Park. Cons • The price tag of paving 19.5 miles of road up Salt Valley and 7.7 miles to Willow Springs would be high. Both roads would start on state trust lands and cross Bureau of Land Management acres before reaching the park, so multiple jurisdictions would need to approve upgrades. Arches’ original entry, from Willow Creek, repeatedly crosses the braided channel of Courthouse Wash. It was abandoned long ago to move the park entry closer to Moab. Establishing additional entries could help reduce congestion by enabling visitors to drive through the park without having to make the 18-mile return trek from Devils Garden to the highway, say road supporters. In the state’s official comments, Herbert urged the park to consider paving the two access roads, which he said could be accomplished without disturbing any untouched areas and would reduce dust. Pros • This idea would open up more parking spots at peak times. Cons • It would degrade the park’s natural values and add to crowding on trails. Arches already has doubled available parking in recent years, and the lots are now reaching a size in which visitors have to hike long stretches of asphalt to reach a trail. Pros • More trails would spread visitors around the park by making unvisited areas accessible. Cons • They would require more facilities in places the park may be trying to keep more primitive in order to preserve solitude.